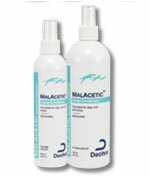 You are buying the Dechra MalAcetic Spray Conditioner For Cats Dogs Horses 16oz Each, model #16MCW. At ADW Diabetes, we offer a wide selection of Dechra products for cats and dogs. Shop with ADW Diabetes and save on all of you pet health care and grooming supplies. The Dechra MalAcetic Spray Conditioner For Cats Dogs Horses 16oz Each is for support of healthy skin for animals with bacterial and/or fungal skin conditions. Convenient spray works as a bath substitute or in-between baths to keep skin and haircoat clean and bacteria/yeast free.